The autumn editon of Homefront is now out! Steve Bullock has been chosen as SHP’s new Chair of the Board of Directors following a recruitment process involving residents, SHP and Sutton Council staff, Board Members and councillors. Steve has personal experience of social housing and a wealth of strategic experience. Steve now wants to be directly involved in delivering better housing for SHP’s residents, and is excited about SHP’s new strategic direction. One of his key priorities is to make the way SHP is governed more transparent and accessible to residents. Steve was Executive Member for Housing at London Councils for the last eight years and is currently a Board Member at the Housing and Finance Institute. He has been a member of the Homes for London Board and its successor, and a Board Member at the Housing Ombudsman. Residents are invited to meet Steve at SHP's annual general meeting on Wednesday 14 November - more information at the bottom of this page. Catherine Charlton has joined SHP as Operations Director. Her priority is to oversee SHP’s move to a fully integrated landlord service. This means bringing together housing management, external services and repairs so you receive a first class landlord service from us. Catherine has joined SHP from Enfield Council where she was Head of Housing Operations. Catherine said: "This is a great time to be joining SHP, in this new role of Operations Director. 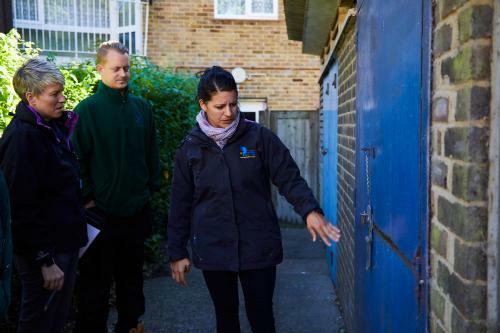 The development of place based teams covering services across housing, estate care, repairs and capital investment will mean our service delivery to residents is local, accessible and agile. This will enable services to develop and change to meet resident's changing priorities and demands. "Since joining SHP I have met with a large number of staff in SHP and Sutton Council, and am starting to develop a structured three-year plan to focus the journey of improving our services to enable a great customer experience. I am hoping to meet as many of our residents through engagement events over the coming months, and to work collaboratively together." Steve Bullock will be formally appointed at SHP's annual general meeting on Wednesday 14 November at Sutton Gate. Residents are welcome to join from 6:30pm for a coffee meet and greet with Steve and Catherine. The AGM will begin at 7:00pm. In January we began a Repairs Transformation Project, working with residents and our main contractors Mears. 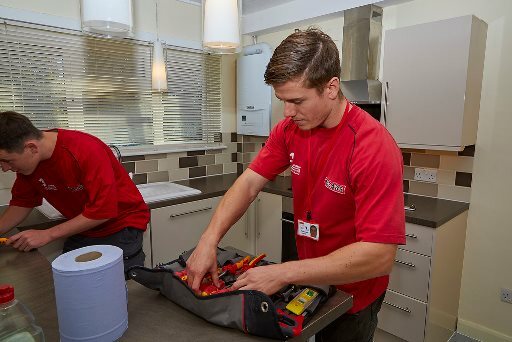 We’re transforming our repairs service to deliver our SHP New Deal responsibility for reliable repairs. To deliver great homes we need you to play your part too. Look after your home. Carry out any repairs you’re responsible for – and let us know about the ones you’re not. Brought our call centre together with Mears’ repairs planners. Brings together the people who answer our phones and the people who arrange your repairs, meaning a more seamless customer service. Given SHP staff access to Mears’ IT systems. SHP staff can access more information about your repairs - and answer more of your questions first time. Drafted a new repairs policy and asked resident representatives to review it. Clarifies which repairs are our responsibility and which are yours. Lets you know what to expect and helps us make quicker decisions about what repairs to do. Improved our website and made it easier for you to report repairs 24/7. Made repairs reporting mobile friendly. You can report repairs quickly and easily when it suits you. Avoid the hassle of having to call us during the day. Improved our text messaging. Now you’ll get a text message with your appointment time, a reminder the day before and live updates on the day. You can respond to messages to let us know you won’t be in, or that something’s not right. Fewer wasted visits, and quicker action to put things right. Increased the spare parts carried by electricians and plumbers. Fewer trips to the suppliers to get parts, and more repairs done on the first visit. A dedicated communal repairs team. Better communication with residents. More transparency about how and when large communal repairs are done. Bringing our repairs team into line with our new patch based Housing Management Team. More local knowledge and communication between staff dealing with your tenancy and your repairs. All day to day communal repairs done within seven days. Faster response to day to day communal repairs. We’re no longer sending automatic rent statements in the post – reducing waste and allowing us to invest better homes and communities. To see a fully up to date rent statement at any time, register for an online account here. 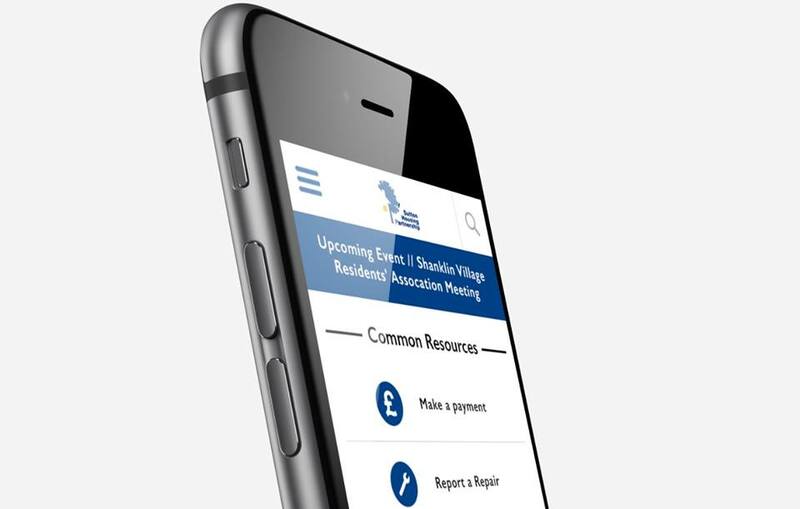 Our online account is mobile and tablet friendly so you can check your rent balance on the go. Everyone who registers for an online account by 16 December will be in with a chance of winning £100 Love2shop high street vouchers - so don't miss out! If you already have an online account, you just need to use it once between now and 16 December to be in with a chance of winning. This could include checking your rent balance, reporting a repair or any of the other functions available through the online account. If you can’t access your online account, you can call 0208 915 2000 to check your balance or request a printed statement. Residents’ third Scrutiny Boot Camp took place on Saturday 29 September - held in partnership between Sutton Federation of Tenant and Resident Associations (SFTRA) and SHP. Listening to you and acting differently is one of our key SHP New Deal commitments. Scrutiny Boot Camps are an open forum where you can tell us what’s working, what’s not and what we can do better. At this boot camp we discussed plans for our Community Hubs, improvement to our repairs service and housing for older people. The table below shows just a few of the things we’ll be doing differently based on your feedback. Want to attend the next Scrutiny Boot Camp on Saturday 24 November? Contact communitydevelopment@suttonhousingpartnership.org.uk or call 0208 915 2000 for more information. You want more information about SHP’s new way of working, Housing Managers and Community Hubs. We sent every resident a letter introducing their Housing Manager, our Community Hubs and their drop-in sessions. 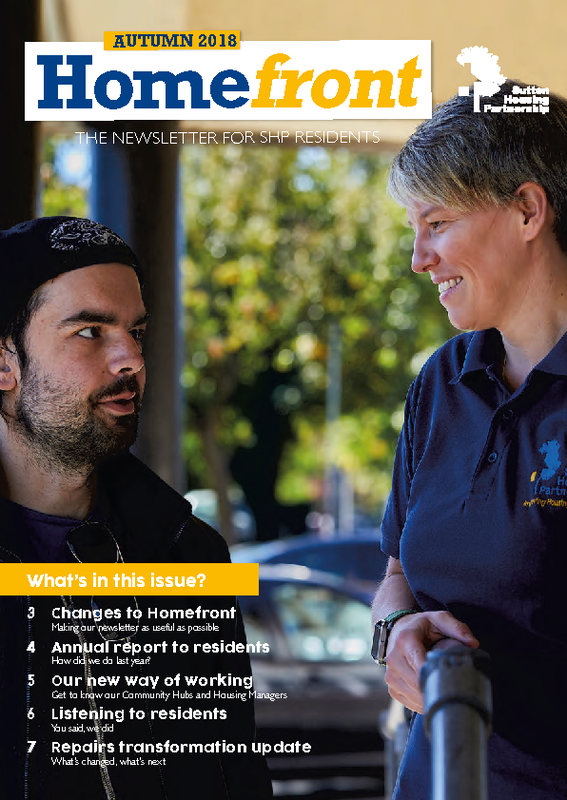 We also included details of our Community Hubs in the autumn edition of Homefront. You want Mears to tell you when they’re coming to carry out repairs, and what they’re doing. You receive a text message from Mears reminding you they are coming and who the operative is. We are looking at how we can improve the text messaging service. Please keep your contact details up to date so we can provide you with regular updates on your repairs. You want a record of your conversations with our surveyors. If you have an SHP surveyor visit you in your home from 1 November we will leave you with a copy of the visit for your records. You want to know what we’re doing to improve our response to anti social behaviour. We have drafted a new ASB policy and shared it with residents for review. Changes include using more targeted mobile CCTV surveillance at hotspots affected by fly tipping,so we can prosecute offenders. Communal repairs weren’t being managed properly. We’ve introduced a dedicated communal repairs team, including a communal repairs surveyor. This will improve communication and transparency about how and when large communal repairs are done.